Snow-free mountains and a recent drought declaration mean that Washington state is facing an extraordinarily risky wildfire season, according to one of the state's top forest officials. "Over the years, people have become fond of referring to Western forests as tinderboxes," State Forester Aaron Everett of the Washington Department of Natural Resources said yesterday. "Our forest is not a tinderbox, it's a 'tinderbomb.' It's sprinkled with gasoline and ringed with dynamite." Washington Gov. Jay Inslee (D) declared a statewide drought emergency Friday. The Carlton Complex fire destroyed almost 300 homes in north-central Washington in July 2014. Photo by Jason Kriess, courtesy of the Washington National Guard. Severe drought blankets over 15 percent of Washington, according to the most recent U.S. Drought Monitor report, but the dearth of snow in the state's mountains this spring is the leading concern. Currently, snowpack is just 16 percent of normal, Inslee's office said Friday. A recent assessment by the U.S. Department of Agriculture's Washington Natural Resources Conservation Service found that of the 98 snow sites measured in the state on May 1, 66 were snow-free. For 11 of the sites, it was the first time they were observed to be snow-free in recorded history. "We're really starting to feel the pain from this snowpack drought," Inslee said in a statement Friday. "We have some tough, challenging months ahead of us." The risky conditions come less than a year after a spate of destructive wildfires struck the Pacific Northwest. 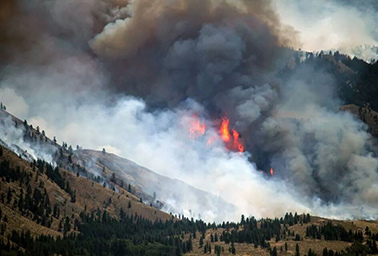 Last summer, Washington saw its biggest wildfire recorded in state history, the Carlton Complex, which destroyed over 300 homes (ClimateWire, July 22, 2014). Everett said that Washington has already seen 110 wildfires to date, including one severe fire categorized as a type 3 incident. "It's just so early to have that type of activity," Everett said. The National Interagency Fire Center earlier this month predicted an above-average, earlier-than-usual wildfire season this year for the Pacific Northwest (ClimateWire, May 4). Even portions of western Washington -- usually regarded as among the wettest, most lush regions of the United States -- could see increased fire risk this year, Everett reported. "We're facing those challenges and risks on both sides of the mountains, which is a rare thing and a thing that causes us great concern," said Everett. While snowpack is unusually low, precipitation has nonetheless fallen at normal levels. As a result, grasses and shrubs "are growing away, happily," Everett explained, meaning that if dry conditions intensify, the growth could provide abundant fine fuel for wildfires to take off. In preparation, Everett said the state has accelerated its training program for firefighters, readying crews earlier this season than in previous years. The Washington Department of Natural Resources has also conducted community meetings to inform homeowners on how best to prepare for a wildfire incident. As in Washington, Oregon's spring snowpack levels are raising concerns. Much of the state's winter precipitation fell as rain, according to the state's Natural Resources Conservation Service. On May 1, the agency reported that snowpack was just 11 percent of normal, and snow was not observed at 97 of the state's 112 monitoring stations. As a result, Oregon's mountains are "missing several feet of water," NRCS Oregon stated in its May report. "We're still seeing near-normal amounts of rainfall, but very-below-normal snow," said Tracy Robillard, a spokeswoman for NRCS Oregon. Currently, 86 percent of Oregon is in drought, the U.S. Drought Monitor reports, with 34 percent -- largely the southeastern portion of the state -- falling under the "extreme" drought category. Oregon Gov. Kate Brown (D) has declared a drought state of emergency for seven southeastern counties. An additional eight counties have requested the same declaration. Joe Stutler, senior wildfire adviser to Deschutes County, Ore., and Western region co-chairman of the International Association of Fire Chiefs, said that, like Washington, Oregon is at risk of a challenging wildfire season. "All the potential is there for lots of big fires, little fires, that certainly [could] potentially tax our system," Stutler said. In light of drought conditions across the West, the National Association of Counties and the International Association of Fire Chiefs recently sent a release to 8,400 county commissioners in 17 Western states advising them to prepare for the worst. "The Western United States is experiencing its fourth consecutive year of drought and snowpack measurements in many parts of the West are under 10 percent of normal," the release read. "The unfortunate truth is these benchmark variables are lining up for what could be an extreme fire season threatening large-scale losses to lives, communities, economies, landscapes, watersheds, and habitat. If current forecasts hold true, the reality is 'defensible space' -- creating a fire resistant buffer around structures and communities -- may not be enough to protect many vulnerable communities." But Stutler added that even if the current drought subsides, he believes the risk of wildfires will remain high for the coming years, and that a focus on creating more resilient forests and educating growing Western populations on how to live with fire will become increasingly important. "2015 won't be the last time we see this," Stutler said. "Regardless of whether you see its changing climates or climate change ... the fires we saw in 2014 and the last decade, that is the new normal." He added, "This isn't, 'Oh, my God, we have a problem for the next three months.' We have a problem for the next decade."